Jeff Markin was a dead man. In fact, he was officially declared dead at 8:05 a.m. in a Florida hospital emergency room. Only 53 years old, Markin was a big, burly, ordinary guy, a mechanic by trade. And he wasn’t a religious man by any means. Heart specialist Dr. Chauncey Crandall was attending to his patients when he was summoned to the emergency room. He knew his presence on the scene was not only a last resort, but also most likely a lost cause. Markin’s heart rhythm had flat-lined with cardiac arrest from a massive heart attack. A full 40 minutes had come and gone since his heart beat last. His pupils were fixed and dilated—he’d been “down” too long. By the time Crandall arrived at the emergency room, Markin’s heart had already been shocked six times with the defibrillator. Just to make sure, his non-beating heart received a seventh shock, also to no avail. Rounds of medication and other efforts had all failed to revive the patient. Markin’s lips, fingers and toes had literally turned black with death from a lack of oxygen. There was no doubt—he was dead. While a nurse prepared Markin’s lifeless body for the morgue, Crandall remained in the room to write up his final report. Then, once he completed his paperwork, he headed toward the door to return to his patients. Standing in the door’s threshold, however, he was overcome with a strong feeling—a deep-seated sense that God wanted him to turn around and pray for Markin. And even though the words Crandall said came through him, he had no sense of devising them—they poured from him of their own accord. Then another strange thing happened. Involuntarily, Crandall’s right arm shot up in a gesture of prayer and praise. At that moment, the ER doctor came back into the room, and Crandall ordered him to give Markin what seemed like one more useless shock from the defibrillator. 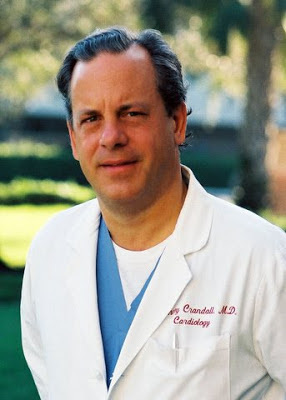 At first reluctant, the doctor finally did as Crandall asked and applied the defibrillator. Immediately, the machine registered a perfect heartbeat. Markin started breathing on his own. His black, cyanotic toes and fingers twitched. Soon, he began to mumble. Jeff Markin had returned from the dead. And Dr. Chauncey Crandall would never be the same again. Crandall’s story doesn't end with Markin’s second chance at life. It’s actually what happened earlier that proves even more compelling. Historically, Crandall kept his conventional Christian faith and his medical practice separate—until June 2000, when he was confronted with the worst nightmare a parent can face: his son Chad’s life-threatening illness. Eleven-year-old Chad and his twin brother, Christian, were happy and athletic all-American boys born to Crandall and his gorgeous high-school-sweetheart wife, Deborah. Chad’s diagnosis of a deadly form of leukemia hit like a bombshell. After the diagnosis, Dr. Crandall cut down his medical duties so he could learn more about the treatment of leukemia—and research what the Bible says about healing. He sought like-minded Christians in his area but was disappointed to find that most of them did not truly believe in the power of prayer to heal. So Crandall had to travel the world and take some unusual paths in his quest for supernatural healing through Christ. Surely there were those who still believed in God’s power to heal through prayer. Of course, Crandall did not neglect modern medicine for Chad. He sought out the best doctors, the best medicine and the best facilities in the country. Yet it wasn’t enough. During his son’s illness, Crandall realized how important it is to stay in shape and take care of yourself. God has work for you to do—and illness will only present a roadblock to your spiritual growth. Dr. Chauncey Crandall is the author of Raising the Dead, in which readers take a walk in his shoes to discover how the grace of God can help overcome disease; how prayer, praise and thanksgiving can do wonders for stress and even eliminate the need for medications; and the problems with and causes of “why me” thinking when something bad happens to you or a loved one.